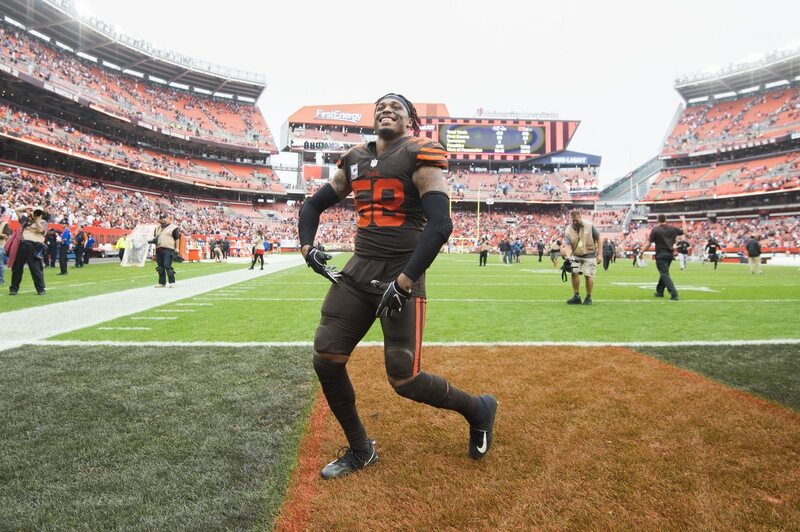 The Cleveland Browns won a football game on a Sunday for the first time since 2015. Staying in the AFC, the Kansas City Chiefs laid down a whooping on the Jacksonville Jaguars, staking their claim as the conference’s best team through the first five weeks. Out west, the Los Angeles Rams continued early-season excellence with an imperfect win over the Seattle Seahawks. And in Philadelphia, the defending champion Eagles proved that they might by in the midst of a Super Bowl hangover. These are among the top takeaways from Sunday’s Week 5 NFL action. It wasn’t as much to make a statement in Le’Veon Bell’s direction. Instead, Ben Roethlisberger’s early-season struggles forced Pittsburgh to rely more on this second-year back Sunday against a bad Atlanta Falcons defense. Boy, did Conner respond in a big way. The kid gained 185 total yards on 25 touches, including two touchdown runs. From there, the balance he created on offense helped Big Ben connect with Antonio Brown in the passing game. This is no small thing. By now, the issues between Roethlisberger and Brown are well known. Feeding Conner the ball and creating said balance helped Pittsburgh to an easy 41-17 win to move to .500 on the season. Now with 581 total yards in five games, it’s going to be hard for Conner to give up primary ball-carrier duties once (and if) Bell does return from his holdout. The Philadelphia Eagles pretty much sleepwalked through the first half of their game against Minnesota on Sunday. In a rematch of last year’s NFC Championship Game, Carson Wentz and Co. put up 81 total yards in the first two quarters. That span of action included Philadelphia’s offense giving up a touchdown on a Linval Joseph fumble recovery. In reality, Doug Pederson’s offense provided more points for the Vikings than its own team in the first half. Ouch. While Philadelphia did respond in the second half to make a game of this, there are still some major issues that need to be worked out before this team can be taken seriously. That includes a lack of skill-position weapons and an offensive line that allowed three sacks and eight hits of Wentz in Sunday’s 23-21 loss. Now at 2-3 on the season, Philadelphia needs to bounce back soon. It’s that simple. Being without both Geronimo Allison and Randall Cobb impacted the Packers in a big way during Sunday’s loss to the division-rival Lions. Mason Crosby missing four field goals and an extra-point attempt also hurt Mike McCarthy’s squad. That’s fine. But the issues for these Packers go much further than that. Primarily, play-calling on offense has been a major issue. How in the world do the Packers continue to call slow-developing pass plays with a banged up Aaron Rodgers under center and the team extremely thin at wide receiver? It led to Rodgers losing two fumbles. Each turnover resulted in a Lions score, leading to 10 extra point for the home team in a game the Packers dropped by eight points. McCarthy has been criticized on a never-ending loop in recent years. But right now, it’s more than justified. We’re not too sure what the Jacksonville Jaguars were expecting when they signed Bortles to an extension this past offseason. After a four-year sample size, it became readily apparent what he was. Maybe, a mid-tier starting quarterback. That’s if we’re being positive. Objectively, Bortles has been nothing better than a bottom-10 starting quarterback throughout his career. That came out in a big way during Sunday’s blowout loss against the Chiefs. Facing a defense that had been torn to shreds through the first quarter of the season, Bortles threw three inexcusable interceptions. One resulted in a Kansas City pick-six. The second one, coming on the very next possession, hit off the head of an offensive lineman and was intercepted in the end zone. That’s a possible 14-point swing in a game Jacksonville ended up losing by 16. For far too long, Denver’s general manager has been saved from criticism by the signing of Peyton Manning years back. That time must now come to a conclusion, with Elway finding himself on the hot seat. After starting the season 2-0, the Broncos have now lost three consecutive games. Sunday against a lesser Jets squad, that included an humiliating effort in a 34-16 defeat. Case Keenum was downright horrible for the vast majority of the game before he padded his stats in garbage time. Meanwhile, a previously elite Broncos defense yielded 512 total yards of offense. That included 310-plus on the ground. In terms of team-building, Elway has failed. Sunday’s blowout loss in Jersey was just the latest example of this. Up 17-0 through the first 35-plus minutes of the game Sunday against Cincinnati, the old Miami Dolphins came back to haunt fans in South Beach. Ryan Tannehill threw two interceptions, one of which was returned by Michael Johnson for a touchdown. He also lost a fumble, which was returned for a touchdown itself. All said, the Dolphins’ final five drives resulted in a punt, interception, fumble, fumble and interception. At 3-1 heading into Sunday’s game and with everything looking stellar early on, the Dolphins found a way to crap this game away in a big way. It’s a continuation of what we saw from Adam Gase’s squad last season. And after a 3-0 start to the season, any feelings of grandeur have been replaced with the reality that this team is nothing more than average. Following last week’s stirring performance in Houston’s first win of the season, Mr. Watson was back up to his old tricks against the Dallas Cowboys Sunday night. Having been hit 10 times throughout the game, Watson’s toughness showed in more ways than one. Sure these pass protection issues represent a black eye for head coach Bill O’Brien, but it’s still amazing to see what the second-year quarterback did. Following an interception late in regular that forced overtime, Watson led his Texans on a seven-play, 72-yard game-winning drive that culminated in a chip-shot 36 yard field goal. After being attended to in the medical tent prior to the drive, a hobbled Watson completed both of his passes for 61 yards. It was yet another defining moment in a young career full of them. And by virtue of Sunday night’s 19-16 win, the Texans’ season has been salvaged. San Francisco should have dominated a winless Arizona Cardinals team at home on Sunday. And while the final box score might tell us that story, five costly turnovers and some dumb mistakes led to a 28-18 loss at Levi’s Stadium. This, despite the fact that the 49ers put up 33 first downs and nearly 450 yards of total offense. Now at 1-4 on the season, San Francisco is about as irrelevant as they come. Given the high expectations surrounding this team heading into the 2018 season, this has to be a bitter pill to swallow. Such is the nature of the beast when a rebuilding team loses both its franchise quarterback and prized running back for the season before Week 4. It’s now all about the youngsters and seeing what they have to offer moving forward. For the first time since December of 2015, the Cleveland Browns have won a football game on a Sunday. And it was all sorts of amazing. Having pretty much led the entire way against the division-rival Ravens, it looked like Cleveland might find itself in a tie for the second time in give games. That’s until Baker Mayfield led the Browns on a game-winning field goal drive in overtime, culminating in a field goal from rookie Greg Joseph as time expired. Now at 2-2-1 on the season, Cleveland has more wins than the Green Bay Packers and Atlanta Falcons. Think about that for a second before we conclude this team isn’t for real. Remember, these Browns could very easily be 5-0 on the season. Yes, it’s a new era for this long-downtrodden franchise. Sunday’s win magnified that to a T.
We’re not sure how good Atlanta’s defense would have been if Pro Bowlers Deion Jones and Keanu Neal weren’t injured early in the season. What we do know is that this unit has no chance against decent NFL offenses. That came out in a big way during Atlanta’s loss to Pittsburgh on Sunday — its fourth loss in five games to start the season. By virtue of giving up 41 points in the blowout loss, the Falcons are now yielding an average of 40-plus points over the past three games. No matter how good Matt Ryan has played, that’s just not going to cut. And it has Atlanta’s season on the verge of collapse before Week 6 even comes calling. Whether it was Isaiah Crowell or Robby Anderson in the first half or the combination of Crowell and Bilal Powell dominating after intermission, the Jets imposed their will in a big way Sunday against the Denver Broncos. Crowell put up 219 rushing yards, including a brilliant 76-yard score. He was joined in the backfield by Powell, who gained 99 yards on 20 attempts. Meanwhile, Anderson put up a 76-yard touchdown of his own. Sam Darnold’s stats might not have been great in the 34-16 win. He completed just 10-of-22 passes for under 200 yards. Though, the Jets’ big-play ability enabled them to break a three-game losing streak in an upset win over a suddenly free-falling Broncos squad. The sample size is now long enough to justify calling Marcus Mariota over-hyped and overrated. Sure he played well in last week’s win over Philadelphia. But over the course of his past 18 starts, Mariota has been nothing special. That continued during what was a disastrous loss to the Buffalo Bills on Sunday. Mariota completed just 14-of-26 passes for 129 yards with zero touchdowns and one interception. He also took two unnecessary sacks that set up longer-than-needed field goal attempts in the loss. Despite his Titans being at 3-2 on the season, Mariota has regressed a great deal from a breakout sophomore campaign. In that 18-game span we mentioned above, he’s totaled 16 touchdowns compared to 19 interceptions. That’s bad. Really, really bad. Much like their Bay Area counterparts, the Raiders head into Week 6 with just one win. Unlike San Francisco, it’s a lack of competitiveness that should concern Jon Gruden and Co. That came out in droves “on the road” against the Los Angeles Chargers on Sunday. In front of pretty much a home crowd, Oakland simply wasn’t competitive throughout the game. It started with the Chargers opening up a 17-0 halftime lead after a dominating first two quarters of action that saw the Chargers capitalize on a fumble by scoring on the very next possession. From there, the Raiders’ lack of real effort showed in a big way. In fact, Oakland fell down 26-3 before a garbage time touchdown. It was another disastrous performance from Derek Carr at quarterback coupled with a uninspired defensive outing that led to the Raiders’ latest loss in what is quickly becoming a season Gruden would rather forget. For a while there on Sunday in Charlotte, it sure looked like Pat Shurmur’s squad would be able to save his first season as the team’s head coach. Rallying from a double-digit fourth quarter deficit, New York took a one-point lead with just over a minute remaining in the final stanza. At that point, previous criticism of Eli Manning and his turnover proneness would be muted. That’s until Panthers kick Graham Gano ghosted the Giants’ hopes and aspirations, leaving the team as irrelevant as ever heading into Week 6. With his Panthers down by one, Gano nailed a 63-yard game-winning field goal as time expired. Said kick moved the Giants to 1-4 on the season and completely out of the NFC Playoff race. Ouch! It was rather simple for the undefeated Rams heading into Sunday’s road day with the Seattle Seahawks. If Sean McVay’s squad was able to come out on top in this one, it would open up a three-game NFC West lead. While two first half Jared Goff interceptions and struggles against Seattle’s rushing attack made this game close, the Rams were able to come out on top by the score of 33-31. As McVay will tell us, it wasn’t a perfect performance by any stretch of the imagination. Too many lanes opened up for Chris Carson and Mike Davis on the ground. Pro Bowler Marcus Peters allowed to touchdowns to an unknown commodity in David Moore. Despite this, the Rams sit at 5-0 on the season and are in firm position to earn a first-round playoff bye. That’s pretty crazy stuff after just five weeks.